The Porterhouse cut is the king of steaks for a reason! When seared to perfection and cooked to a precise medium-rare, this primo cut is tender and a worthy centerpiece for a steakhouse menu. When topped with an herbaceous butter, the satisfaction level skyrockets. 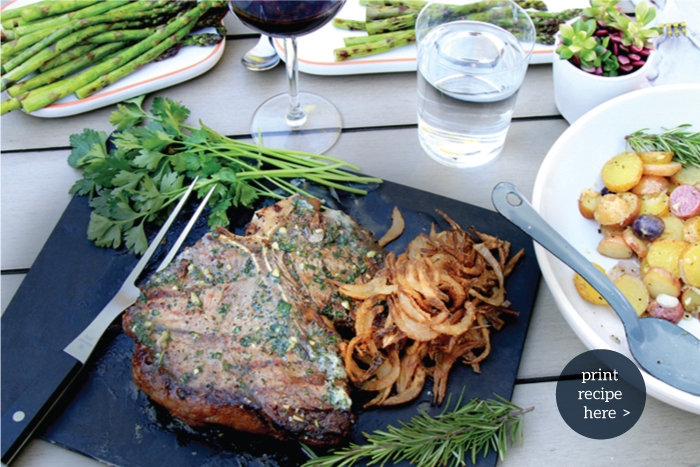 Serve this grilled steak with a side of frizzled onions to complete the entire experience. 1. Coat the steak generously with kosher salt and pepper. Press and rub the seasoning into both sides of the steak. Allow the steak to come to room temperature -- about one hour. Rub fresh lemon juice on the fatty edges and areas to avoid any excess charring. 2. Fire up the grill, bringing the heat to a hot, hot temperature. 3. Place the steak on the hot grill, and sear the first side for 5 minutes. Cover the grill, during cooking and avoid the urge to check or move the steak around. During this time, a seared crust will form assisting in keeping the juices within the steak. 4. After five minutes, flip the steak once, and sear on the other side for 3-5 minutes (depending on the thickness of the steak). Take the temperature of the steak, and determine the desired doneness. We prefer our steaks at 135 degrees F for a rare to medium-rare steak. 5. If the steak needs to cook longer, turn the burners down to low, or move to an indirect area on the grill until the steak reaches the desired doneness. Check the temperature every 1-2 minutes to avoid overcooking the steak. 6. Once the steak reaches the desired doneness, remove it from the grill and let it rest for 5-7 minutes. Don't slice into it, or wrap it, just let it rest. While the steak rests, place a few pats of herbed butter (see below) on the top, and let it slowly melt into the seared crust. 7. After the steak rests, serve and enjoy! Mix the softened butter with all of the other ingredients until well incorporated. Place in plastic wrap and form into a log shape. Refrigerate or freeze the butter until ready to use. Simply slice a few tablespoons, and melt onto the resting, cooked steak. Coat the onion slices with flour. Heat the oil until it is ready for frying-- about 350 degrees F. Test to see if the oil is hot enough by placing a wooden spoon handle in the oil - if bubbles rise up along the handle, the oil is ready. Fry the onions in batches until just golden brown. Drain on a paper towel-lined plate and serve as a side to a perfectly grilled steak.